I like to participate in online design challenges, but I often have trouble completing my design in time because some of my creations take a while. 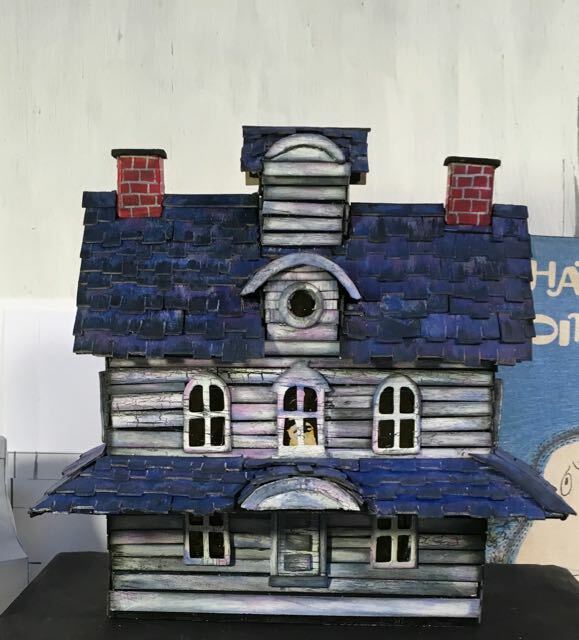 My latest project is a fairly detailed little house, Gus the Ghost’s House based on a book What’s a Ghost Going to Do? It’s a story about a ghost that lives in an attic of an old house where a family stays each summer. 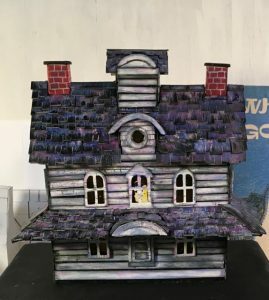 (Spoiler alert) The family decides that the house is too old and run down to maintain so they decide to sell it so it can be torn down for a park. 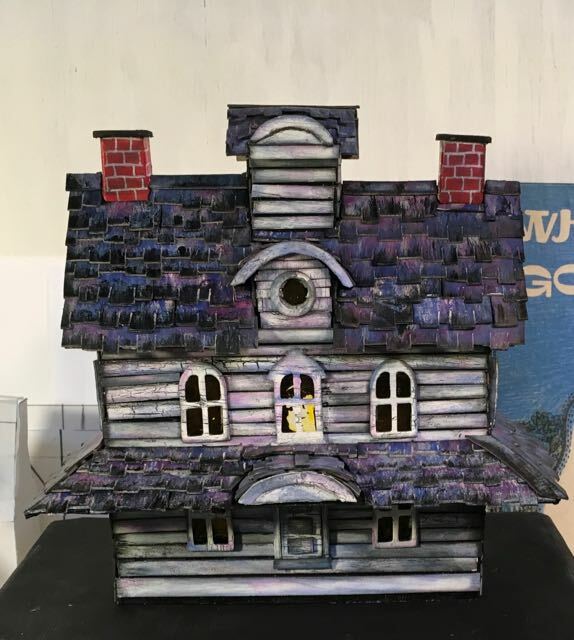 Gus was able to convince the new owner that the house is worth saving and turned it into a museum with Gus as the resident ghost, happily banging and clanking away in the attic. My point is that finding a challenge to fit this project is unusual, but guess what? This week’s Simon Says Stamp Monday Challenge is — “Mythology/Inspired by a Story”. How perfect is that? Cover of the book, What’s A Ghost Going to Do? Since this house is based upon a book, I used the book that made 2 weeks ago as the base. I need to figure out how to make an embossed title for the book. Another challenge for another time. 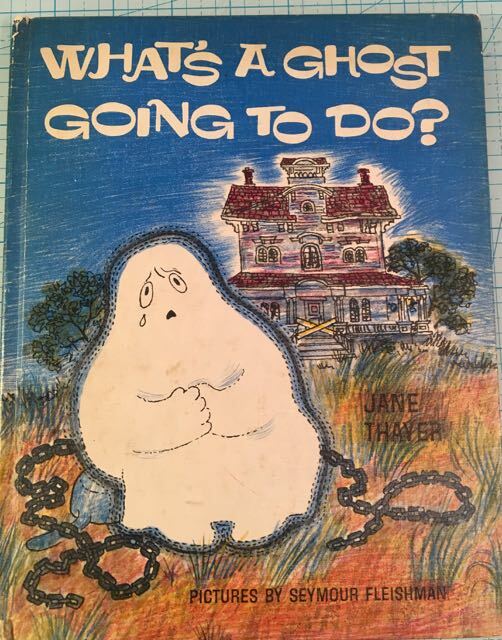 Front of the Gus the Ghost’s House with the book in the background. Basic structure of Gus the Ghost’s House. This house has a very simple basic structure – just 2 gables on each end. The challenge comes in the later details. I always paint the house black if I am going to add siding so the cardboard won’t show between the rows of siding. The white edges on the corners of the porch roof are tissue paper reinforcements. 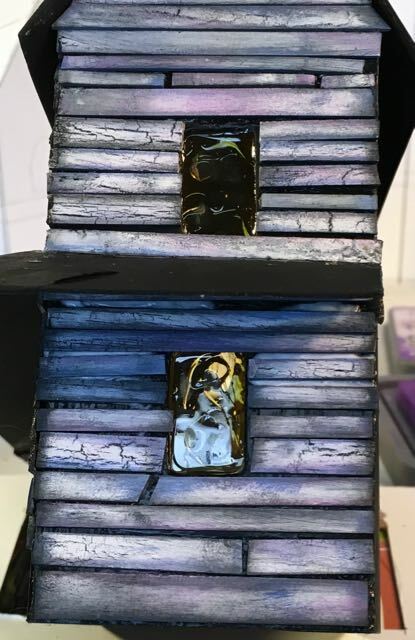 They were painted black before I added the roof shingles. Adding siding to the little house. 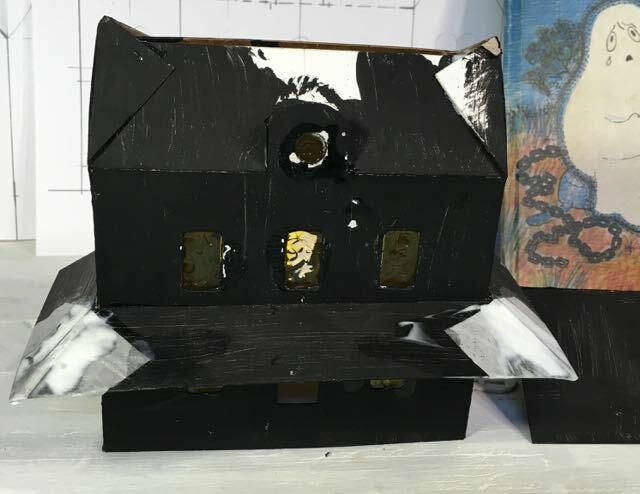 Smear some glue around to attach the siding to the little house. Smooth out the glue for better adherence. Now you see why I always have glue blobs on my fingers. The pieces of siding for this house are glued on one at a time. It makes better looking siding though it can be tedious. I even inked each piece individually to give the colors that the Seymour Fleishman painted on the front of the house in the book. Front of Gus the Ghost’s House is almost done. It needs the columns to support the porch roof, the porch floor and a couple of steps. Oh, and something needs to be done about the roof. I just couldn’t do the colors to match the book. Fixed the color on the roof with a wash of Blueprint Sketch blue distress paint. 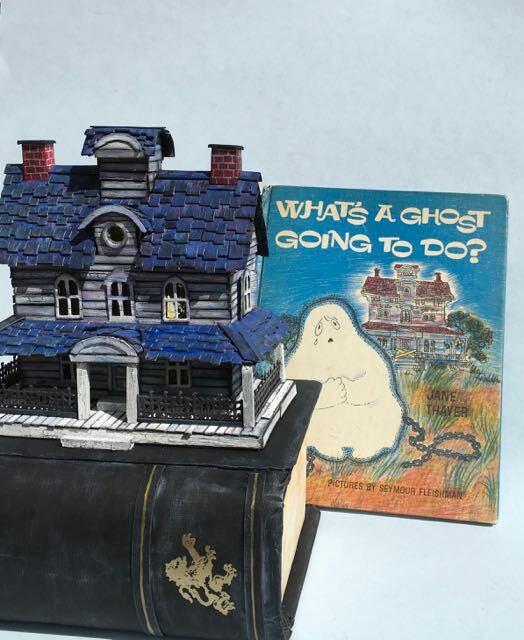 Gus the Ghost’s finished house on a book base with a drawer. 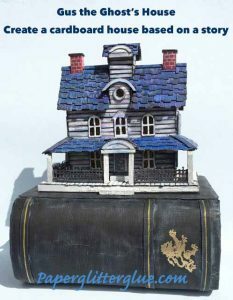 That’s the story of this little house based on a story. I hope you enjoyed reading about it. I am happily sharing it with the Simon Says Stamp challenge Mythology/Based on a Story. OMG Lucy – another magnificent creation. This is really outstanding. Just amazing. I love the purple color in the siding. I hear you about glue, I was in a meeting the other day picking glue off my thumb, it had to have been there for awhile and I just didn’t notice. Hi Lucy! I saw this house in a FB group this morning and was looking forward to being able to come and read your post after work. This siding looks great – as always! Love your process for making it. I enjoy seeing process photos and reading about your techniques. 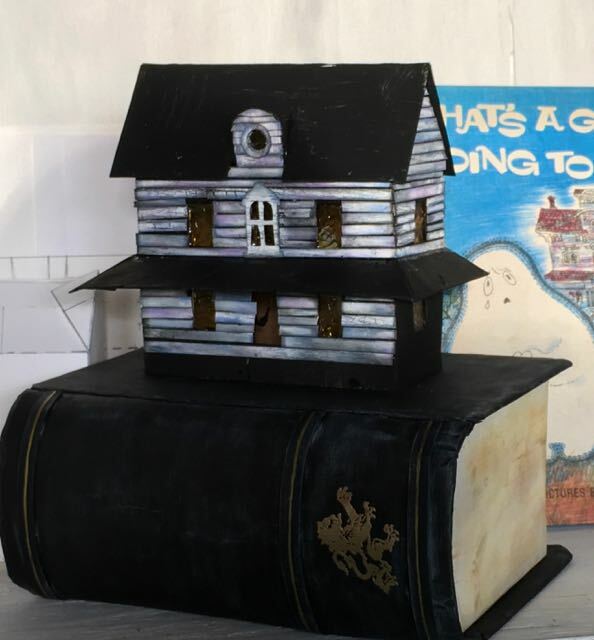 And what a great house to put on top of the book you made! 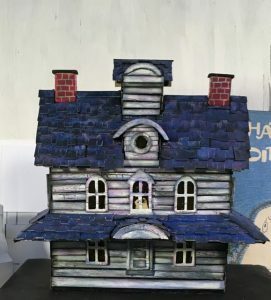 How tall is the book and how tall is the house? Book cover 8.5 inches along the spine x 7 inches. Book depth (how tall it is lying on its side) is 4 inches. What a fabulous project and a wonderful blog post to go with it! I know what you mean about aligning our creative efforts with challenge deadlines, but I’m so glad it worked out in this case! 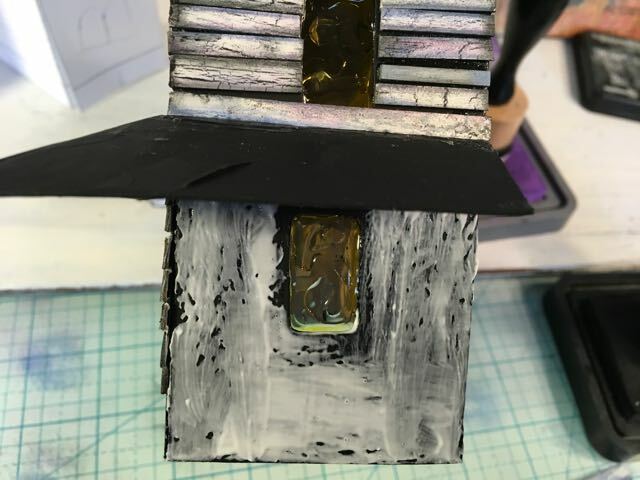 The house is so lovely with all of the amazing texture you created and I enjoyed reading about your story that inspired it all. 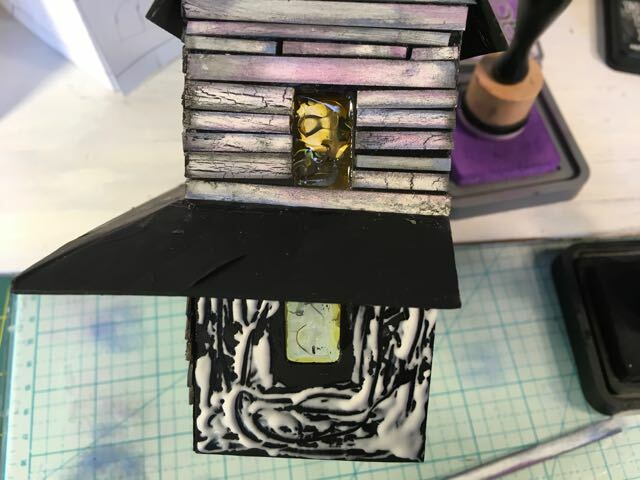 This was a treat to see and to read and I’m so glad you shared it with us for this week’s Simon Says Stamp Monday Challenge! Andrea, I am so excited to hear from you because I love your projects. Thank you so much for reading the about how this project came about. P.S. You inspired one of my very best Halloween projects – the Grumpy Back Seat Driver based on a flying car. 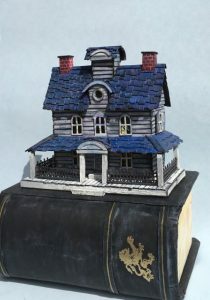 Love the house, the story, the book stand! So glad you could do a link up with Simon (I know what you mean about deadlines–sometimes it takes me a week just to think of an idea–hah!). 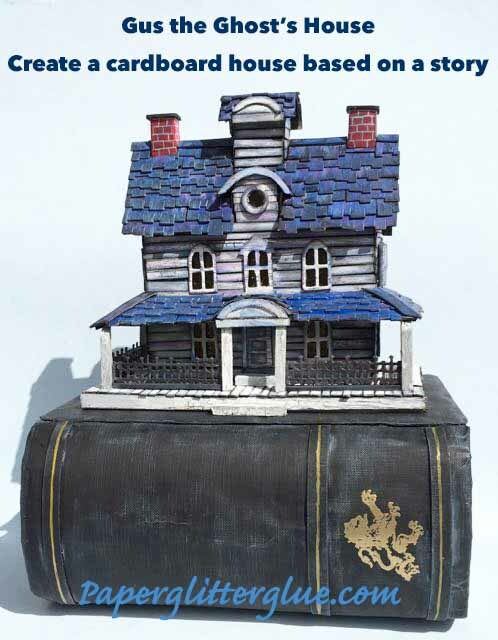 I like the idea of putting the house on the book, it goes along with the basis of the making of the house. And a handy place to store the extra’s or even the house if you didn’t actually glue it to the top and just on another base. So many good and creative ideas!